Once you have loaded (video) files, you may create pictures from thumbnails. 1°) Right click over the preview you want to "Thumbnail". Source : By default, the preview number you selected is checked. You may select others previews or All previews for a complete thumbnails creation. SaveToDisk : Will save created picture to hard drive if checked. If not, picture will only be shown (usefull for testing). 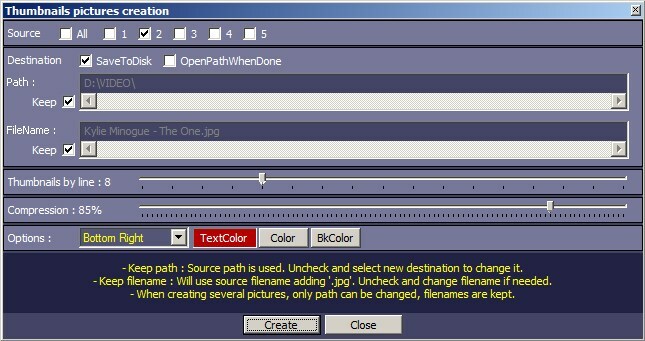 OpenPathWhenDone : Will open every picture's path once creation is finished. Warning : using 40 previews will open 40 windows !!! Thumbnails by line : defines how many thumbnails are created on each line (columns are always automatic). 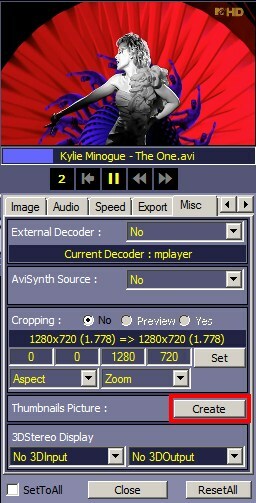 Compression : JPG Compression level (85% is default). Options : Where to place time display (7 possibilities) : No Time Display / Top Left / Top Center / Top Right / Bottom Left / Bottom Center / Bottom Right. BkColor : Text Background color. Example using 4 thumbnails by line, time at Top left position : Full size picture. Example using 6 thumbnails by line, time at Bottom Right position : Full size picture. - When selecting several previews, only one destination path can be selected. - If Keep is checked, every file's source path is used.